Crusaders celebrate moving into a 2-1 lead during victory over Warrenpoint Town. Pic by INPHO. A stirring second-half comeback saw Crusaders pick up their fourth win in a row in all competitions as they came from behind to blow away Warrenpoint Town at the Q Radio Arena by 3-1. Lee Duffy had put the hosts in front on the stroke of half-time - but the introduction of Jordan Owens and David Cushley just before the hour changed the game and, although neither scored, their presence alone turned Crusaders’ pressure into end product, with Billy Joe Burns and a Simon Kelly own goal helping the away side deservedly take all three points. The first half proved to be something of a flat affair, with plenty of action in between each penalty area but precious little inside the 18-yard box. The first clearcut opportunity arrived midway through the half when Warrenpoint midfielder Conall McGrandles glanced a header goalwards only to see Matthew Snoddy in the right place at the right time to clear the ball off the line. The Crues then had three excellent chances to break the deadlock within eight minutes of each other after the half-hour mark. The first came on 30 minutes when Burns curled in a free-kick from the right that was met by Kyle Owens from 12 yards out but the defender powered his header over Beraat Turker’s crossbar. 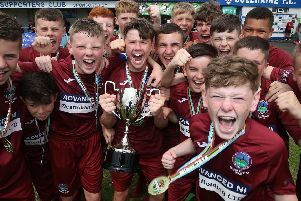 Four minutes later, Rory Patterson’s attempt on goal from a 20-yard free-kick pinged around the Warrenpoint box before falling to Philip Lowry, but as he went to drive the ball home, Duffy slid in to deflect the ball over the bar. Their third – and arguably best – chance of the half came seven minutes before the break when Reece McGinley charged down Anto Reilly’s attempted clearance, which set Patterson clear down the left-hand side. He cut on to his right foot and curled in a low shot that beat Turker, but whistled past the right-hand post. The hosts then took the lead in the first minute of stoppage time when the lively Ciaran O’Connor was fouled 20 yards out and Duffy stepped up to curl a low free-kick past Sean O’Neill and into the bottom-left corner, with the Crues keeper probably feeling he could have done better. But Stephen Baxter’s men should have drawn level just three minutes after the restart when Patterson set Ronan Hale bearing down on goal. However, the forward delayed his shot and that allowed Emmett Hughes to get across and make a superb sliding tackle to clear the danger. Stephen Baxter introduced Jordan Owens and Cushley for the ineffective Patterson and Hale just before the hour, but it was Warrenpoint who almost made it two on 63 when Duffy’s dangerous driven cross from the right was inches out of the reach of Philip Donnelly. However, the Crues did get back on level terms on 69 minutes when McGinley’s cross from the left dropped down to the feet of Snoddy and he smashed it home from close range. Then two minutes later they went in front when Burns superbly hooked the ball home from 18 yards with a fine finish. The result was then done-and-dusted for the Crues on 76 when Warrenpoint substitute Simon Kelly looped a header past his own keeper following another McGinley cross from the left. It could have been four three minutes later when Cushley teed up Lowry and his cross-shot should have been put in by Jordan Owens but he somehow contrived to put it over the bar from point-blank range. However, the fourth wasn’t required as the Crues kept in touch with second-placed Ballymena in the Danske Bank Premiership table with six games to go. Warrenpoint Town: Turker, Young, Hughes, Wallace, McGrandles (Kelly, 69), Reilly, Marques (McCaffrey, 81), O’Connor, Scannell (Magowan, 70), Donnelly, Duffy. Subs (not used): Byrne, Moan, J.Lynch, Copes. 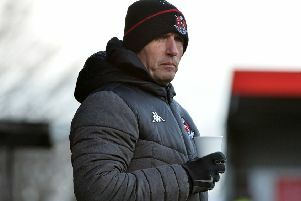 Crusaders: O’Neill, Burns, McChrystal, Coates, K.Owens, Lowry, Snoddy, Thompson, McGinley (Ruddy, 86), Patterson (J.Owens, 59), Ronan Hale (Cushley, 59). Subs (not used): Doherty, Beverland, Ward, Brown.